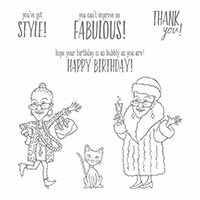 You've Got Style Wood-Mount Stamp Set by Stampin' Up! Personality is a difficult thing to quantify, but we're pretty sure the characters in this set have personality in droves! If this set speaks to you--either for yourself or for someone you love--step up and add this bold and brassy set to your collection.